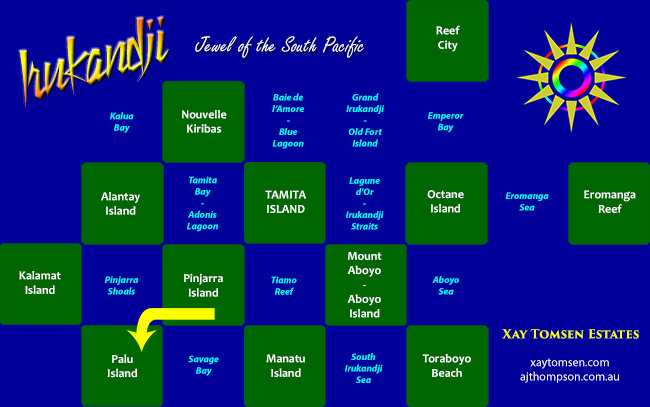 NOTE: This page is about Palu Island in InWorldz. 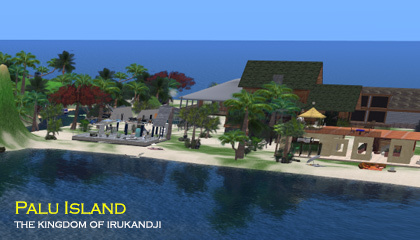 The Second Life version is here: Palu Island in Second Life. 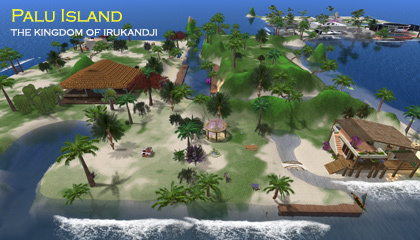 Palu Island is a residential sim on The InWorldz grid, located in the southwest of the Irukandji Continent. Along with Kalamat Island to its immediate northwest, Palu Island is the only region in Kalamat State. 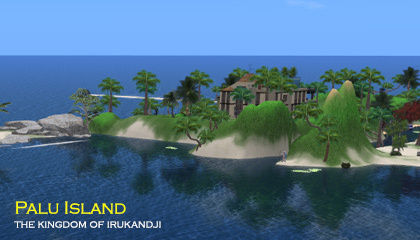 Notably, Palu Island fills a much different grid space to that which it held in the midwest in Second Life, and this was purely due to the smaller grid size in InWorldz. Also of note is that this second rendition of Palu Island performed far better than the original. When I originally commissioned Palu Island at the same time as Manatu Island which shares the same latitude. My plan was to develop Manatu first and have Palu as a reserve. For this reason, Palu Island had a rather flexible landscape at the beginning. The initial form of Palu Island had a narrow strip of beach around the entire island, with a flat mountain at its centre sorrounded by a caldera wall. The purpose of this layout was to road-test new vehicles, following the release of code on the grid that made vehicles (briefly) Second Life compatible. This setup on Palu Island lasted only a few weeks, as the land on Manatu Island was selling steadily. I decided to create a new driving sim, Octane Island, and to convert Palu Island into a residential sim. I did like Palu's unusual shape though, and on the northwest and southwest corners, the original high ground remained. The rest was made level, with an arm of the Maskari-Aboyo river systems passing through the island. Adjoining Palu Island, clockwise from northwest, were Kalamat Island, Pinjarra Shoals, Pinjarra Island, and Savage Bay. Below are some photographs of Palu Island that I took during my travels around the islands.